GeneSpring 11 updates are now rolling out. In order to see what the updates entail, I grabbed a couple sets of microarray files that I have interrogated so thoroughly that I have the heatmaps memorized. 2) The Guided Workflow is no different, except the thumbtack feature when looking at the overall statistics is a little less glitchy. In GX 9 once I set a thumbtack on the graph I want to see, the program seems to strobe the charts kind of randomly. 3) Big improvement: In the exporting of your final list of differentially expressed genes --> the orientation no longer changes when you copy to Excel. GX 9 will show you fold change between the genes up-regulated in condition 1 vs. condition 2. When you export the data to Excel, the spreadsheet will now be condition 2 vs. condition 1. This can cause some serious confusion when you don't know your experimental model very well. At least in this dataset, GX 11 did not have this glitch. 4) Direct link to Ingenuity Pathways Analysis. This is another nice improvement. The transition of the results into IPA happens almost automatically. You don't have to export to Excel, convert your data into tab-delimited text, then import it into IPA. Summary: Very nice improvements. Since the upgrade is free for all Genespring subscribers, You really should download the file. It won't slow down your experiments, and should only simplify things for you! My new book is out! And you can purchase it at Amazon. Whether or not to make it available for Kindle is still under consideration. I don't know how useful it would be and whether it would really be worth my time. The first time I see someone with a tablet in use in a lab, I may go to the effort to make this available in digital format, but I still haven't seen it happen. Its coming, especially with the iORBI thing. 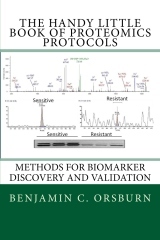 Big shoutouts got to David Berryhill at Johns Hopkins for critically reviewing this text and to Michael Mullendore for assistance with the sections on protein validation.